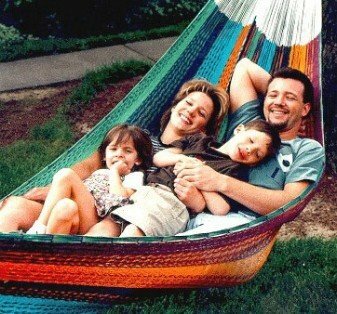 So you’ve bought the perfect hammock, you love it and your family and friends love it. However, you may have some questions in regards to your new relaxation piece. We are here to help you answer those questions. Read on to find out the answers of our most frequently asked questions. 1. Can I leave my hammock outside in the snow during the winter? We suggest that you store your hammock in a cool and dry place during the winter months. This will help give your hammock a longer life and it will be ready for you to set up come spring. 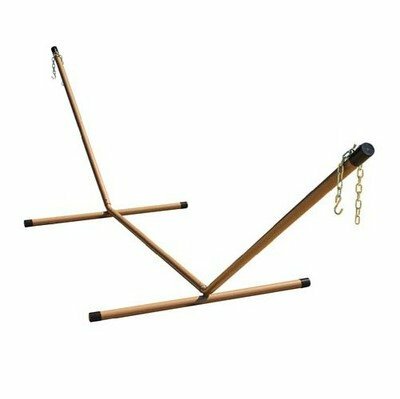 Hammock stands can be fairly easily disassembled as well for storage purposes. 2. Can I leave my hammock outside for the entire duration of the summer? It is advised that you bring your hammock inside or store it when it is not in use. Doing so will limit the amount of exposure to the elements which will in turn prolong your hammock’s lifespan. 3. Can all hammocks hold more than one person? The amount of people a hammock can hold depends mainly on the maximum weight capacity of the hammock. It is the responsibility of a user to ensure that they abide by the maximum capacity so their safety is not put at risk. 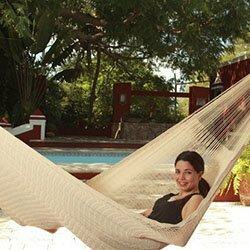 The weight capacity of your hammock should be included on an instruction sheet that came with your hammock or on the packaging of your hammock. 4. 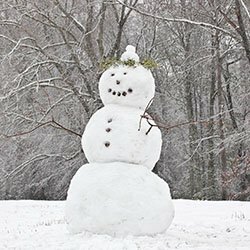 Will hanging hooks damage my trees? An amazing characteristic of trees is the ability to close over wounds, so a hook screwed into a tree is unlikely to cause damage. If you choose to use the less invasive tree straps to hang your hammock, make sure you remove them from the trees to prevent girdling. Girdling can occur if a tree grows and the strap is not removed. 5. How much will my hammock stretch? Over time, most hammocks will stretch anywhere from a few inches to as much as two feet. It all depends on the material the hammock is made from. 6. 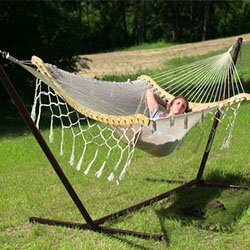 What is the ideal amount of hanging space for my hammock? 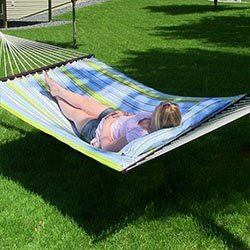 Typically the ideal space measures out to be about two feet greater than the total length of the hammock (when measured from one end loop to the other). For example, if your hammock is 13 feet long from end loop-to-end loop then you should plan on having 15 feet of open space for hanging. .
7. When I lay in my hammock I am closer to the ground than I used to be. How can I make it higher again? Hammocks naturally stretch. To fix this, try tightening the hammock by moving the chains on your hammock’s end loops. You may not be able to adjust the chains if your hammock is older; if that’s the case, try increasing the distance between the two posts or adjust the height if your space allows. Unfortunately this could also be a sign that your hammock is nearing the end of its useful life and it may be time for a new one. 8. My stand wobbles a little bit, is this normal? Yes, it is normal for hammock stands to have a little bit of wobble. 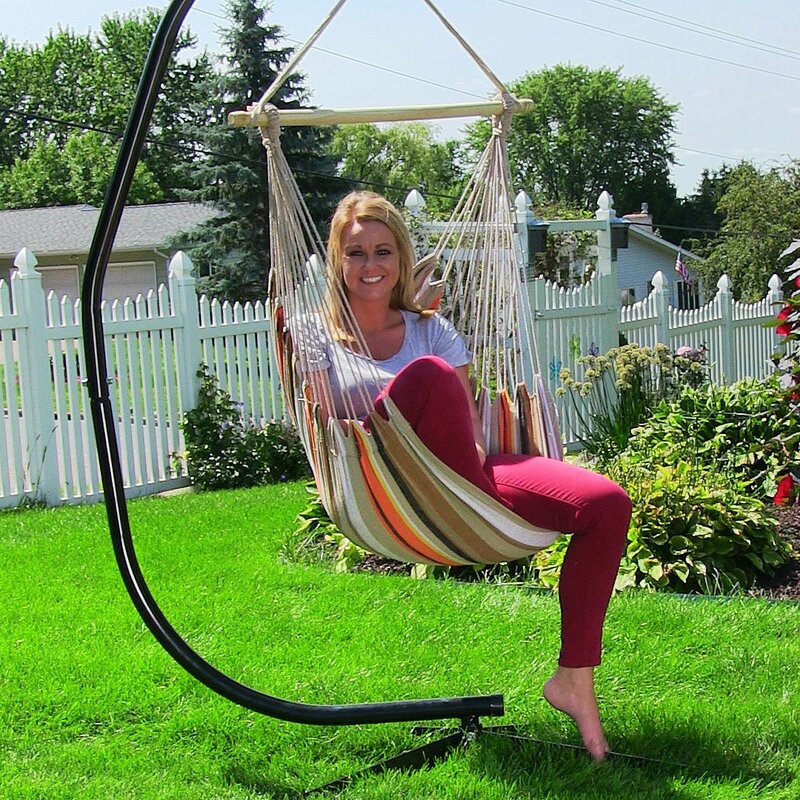 Our stands are manufactured to allow for the natural swaying motion that relaxing in a hammock provides. 9. How can I clean my hammock? > For hammocks with spreader bars you will want to clean it with a mild detergent and water in a bath tub and then air dry. 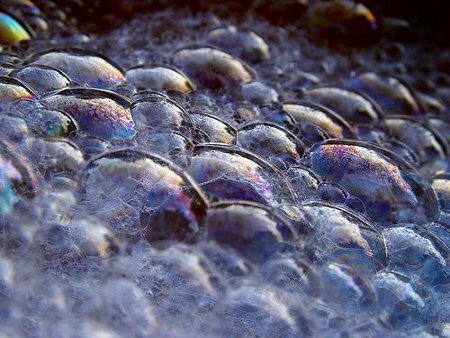 > For quilted and fabric hammocks use a scrub brush with mild detergent and water, scrub, hose it off completely and allow to air dry. 10. 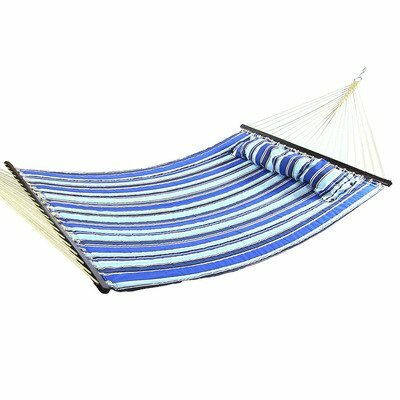 If I hang my hammock indoors or out on my patio how far should I hang it from walls? Make sure you hang your hammock at least three feet from walls and any other structure. In addition, be sure to leave some space around the sides of your hammock to allow for a gentle swinging motion. 11. 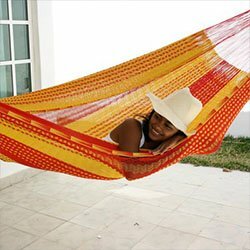 Are there alternatives to hanging hammocks between trees outdoors? > You could hang it from a hammock stand. > You could also hang it from 4 x 4 posts secured in the ground with cement. > You can hang it indoors between two walls or even between two buildings (i.e., the garage and the house). > You could even mix it up a bit and use the side of the house and a 4” x 4”post. 12. 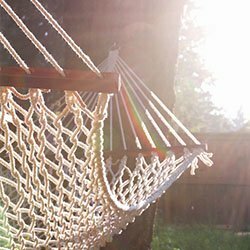 What are safety precautions that I should take into account when using my hammock? > Do not exceed your hammocks maximum weight capacity. > Do not allow children to use your hammock without adult supervision. > Do not allow children to play in your hammock (this includes jumping, spinning, walking, etc.). Allowing them to play in the hammock could be extremely dangerous. > Make sure that hammock chains do not become twisted and be careful not to flip your hammock over while it is hung; doing either of these can weaken the chain strength. > Be sure to inspect your hammock before getting into it. Rodents, birds and bugs tend to use hammock rope fibers to build nests; if the rope is compromised it may be dangerous.